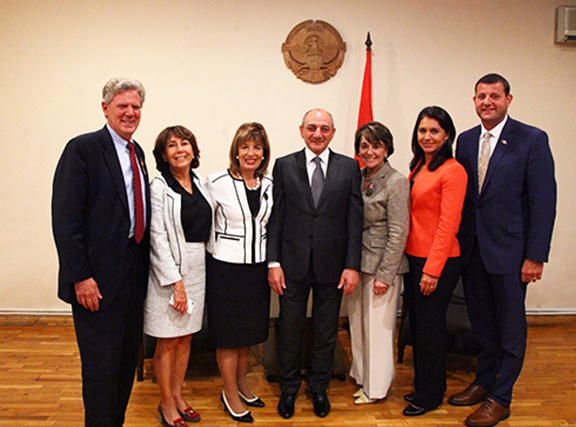 Pictured L – R are: Congressman Frank Pallone, Maria Mehranian, Congresswoman Jackie Speier, His Excellency Mr. Bako Sahakyan – President of the Artsakh Republic, Congresswoman Anna Eshoo, Congresswoman Tulsi Gabbard, and Congressman David Valadao. Known for her civic and community involvement here in Southern California as a business and community leader, Cordoba Corporation’s Managing Partner and Chief Financial Officer Maria Mehranian is also Making a Difference internationally in Armenia. Maria, who currently serves on the Board of Trustees at Woodbury University and the Dean’s Leadership Board at Cal Poly Pomona College of Engineering, and who previously served as Chair of the Los Angeles Regional Water Quality Control Board, recently returned from a weeklong trip in mid-September to Armenia representing the Armenia Fund, Inc. The Armenia Fund, Inc., which is the largest Armenian-American grassroots, non-membership charity in the United States, has raised more than $120M for humanitarian and infrastructure development in Armenia. Serving in her role as President of the Armenia Fund, Inc., Maria joined approximately 45 volunteer medical professionals from Adventist Health Glendale on their third medical mission to the Noyemberyan Hospital, located in Armenia’s northeastern Tavush region, near the border with Georgia and Azerbaijan. Approximately 2015 patients were seen for extensive clinical checkups and free medications; 78 surgeries were performed within 5 days by the surgical team; and 230 orthopedic interventions were performed. A focus was placed on women’s health — including cancer screenings by an expert team of clinicians and pathologists. A focus was placed on women’s health — included cancer screenings by an expert team of clinicians and pathologists. 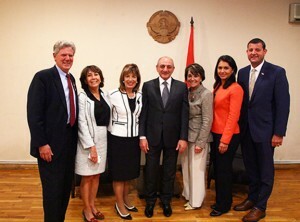 While in Armenia, Maria, who is a past recipient of the Ellis Island Medal of Honor for exemplifying outstanding qualities in both her personal and professional life while continuing to preserve the richness of her Armenian heritage, also joined a delegation from the US Congressional Armenian Issues Caucus. Along with the Congressional delegation, Maria attended several meetings and events, including meetings with Speaker of the National Assembly of Armenia and the heads of standing committees, as well as the head of the US-Armenia Friendship Group. The delegation was joined by the Ambassador Extraordinary and Plenipotentiary of the Republic of Armenia to the US as they met with key civic, religious and community leaders, including the Supreme Patriarch and Catholicos of All Armenians. The delegation also visited the Artsakh Republic and met with the leadership of the Republic. The US Congressional Armenian Issues Caucus was founded in 1995 to give Members of Congress a platform to advocate for issues relating to Armenia, and the opportunity to educate their colleagues on the subject. Caucus members who participated in the mid-September bi-partisan delegation to Armenia included Frank Pallone, co-chair of the Caucus (D-New Jersey), Anna Eshoo (D-California), Jackie Speier (D-California), David Valadao (D-California), and James Sensenbrenner (R-Wisconsin). In addition, House Foreign Affairs Committee Member Tulsi Gabbard (D-Hawaii) also joined the delegation.